A favicon (short for favorites icon) helps your site stand out amid the competition by displaying a small image in your visitors' web browser tab. It will also appear in a browser's list of favorite or bookmarked pages. In the Favicon panel, click Upload and navigate to the image you want to use. Note: The image should be no more than 180 pixels square. And keep your favicon simple and punchy — you don't want people squinting. Click Done when you're finished, and when you're ready, click Publish Site/Publish. Click Visit Site to see the site's favicon in your web browser's tab or navigation bar. 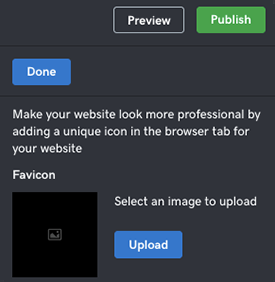 Add Favicons on Website Builder 7 That Works For iPhone And Android?